I rarely venture into large retail areas and shopping centres. They make me feel unwell. I’m rather claustrophobic to begin with. I also have lupus, one of my symptoms is a quite extreme photosensitivity. The lighting in these places quite often triggers an attack of vertigo, nausea, incapacitating disorientation, co-ordination difficulties, muscle rigidity, temporary and severe visual distortions and a very severe headache. However, I visited one recently with a friend, who was doing some last-minute Christmas shopping. He promised we would visit just two shops, and that our visit would be over quickly. What struck me straight away is how much retail design is now just about revenue-producing. Shopping malls are unforgiving, soulless and unfriendly places. I was reminded of something I read by David Harvey, about the stark reality of shrinking, privatised and devalued public spaces. Neoliberal marketisation has manifested ongoing conflicts over public access to public space, where profiteering reigns supreme. 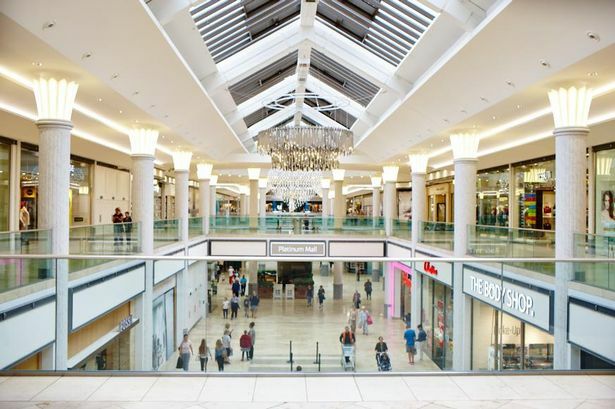 My experience of a shopping mall was deeply alienating and physically damaging. It brought with it a recognition of how some groups of people are being coerced and physically situated in the world – how citizens think and act is increasingly being determined by ‘choice architecture’ – which is all-pervasive: it’s situated at a political, economic, cultural, social and material level. 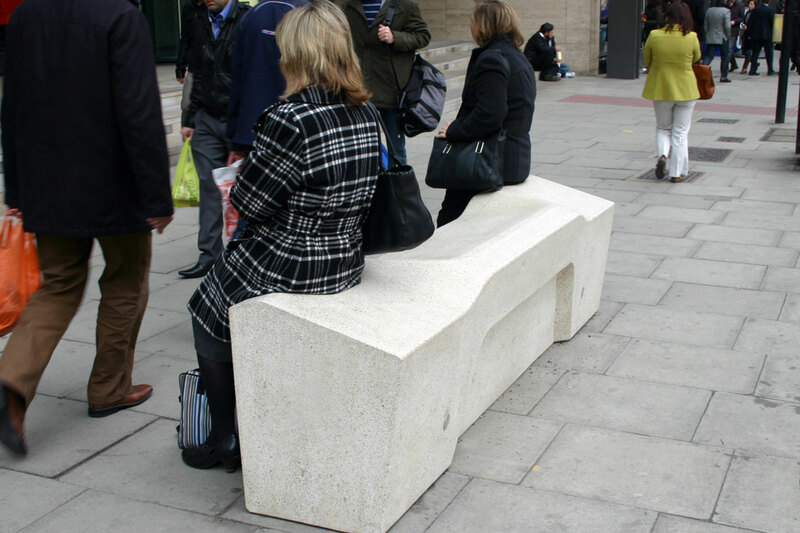 Hostile architecture – in all of its forms – is both a historic and contemporary leitmotif of hegemony. The shopping mall made me ill very quickly. Within minutes the repulsive lighting triggered an attack of vertigo, nausea, co-ordination and visual difficulties. I looked for somewhere to sit, only to find that the seating was not designed for actually sitting on. The public seating that’s just a prop. This radically limited my choices. In order to sit down to recover sufficiently to escape the building, the only option I had was to buy a drink in a cafe, where the seating is rather more comfortable and fulfils its function. I needed to sit down in order to muster myself to head for the exit, situated at the other end of the building. At this point it dawned on me that the hostile seating also fulfils its function. In my short visit, I had been ushered through the frightfully cold, clinical and unfriendly building, compelled to make a purchase I didn’t actually want and then pretty much rudely ejected from the building. It wasn’t a public space designed for me. Or for the heavily pregnant woman who also needed to sit for a while. It didn’t accommodate human diversity. It didn’t extend a welcome or comfort to all of its guests. The functions and comforts of the building are arranged to be steeply stratified, reflecting the conditions of our social reality. The only shred of comfort it offered me was conditional on making a purchase. 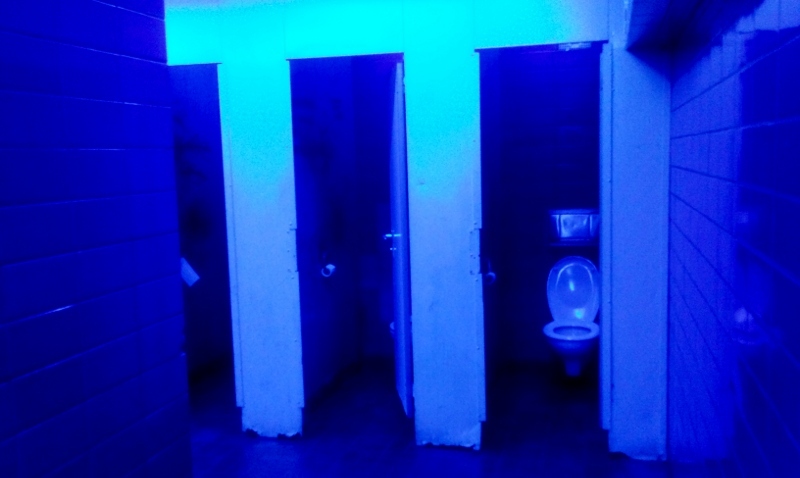 Blue lighting has been used in public toilets to deter intravenous drug users; the colour allegedly makes it harder for people to locate their veins. It was claimed that public street crime declined in Glasgow, Scotland following the installation of blue street lights, but it’s difficult to attribute this effect to the new lighting. Blue may have calming effects or may simply (in contrast to yellow) create an unusual atmosphere in which people are uncomfortable – actingout or otherwise. So questions remain about causality versus correlation. Again, no-one is monitoring the potential harm that such coercive strategies may cause. Blue light is particularly dangerous for some migraine sufferers and those with immune-related illnesses, for example, and others who are sensitive to flickering light. Earlier this month, Britain’s statistics watchdog said it is considering an investigation into comments made by Theresa May following complaints that they misrepresented the extent of homelessness and misled parliament. The UK Statistics Authority (UKSA) confirmed that concerns had been raised after the prime minister tried to claim in Parliament that ‘statutory homelessness peaked under the Labour government and is down by over 50 per cent since then.’ Official figures show that the number of households in temporary accommodation stood at 79,190 at the end of September, up 65% on the low of 48,010 in December 2010. Liberal Democrat peer Olly Grender, who made the complaint, also raised concerns last year about the government’s use of the same statistics. Baroness Grender’s previous complaint prompted UKSA to rebuke the Department for Communities and Local Government. The department claimed homelessness had halved since 2003 but glossed over the fact this referred only to those who met the narrow definition of statutory homelessness, while the overall number of homeless people had not dropped. May was accused of callousness when Labour MP Rosena Allin-Khan recently raised questions about homelessness and the rise in food bank use. The prime minister responded, saying that families who qualified as homeless had the right to be found a bed for the night. She said: “Anybody hearing that will assume that what that means is that 2,500 children will be sleeping on our streets. It does not. Finger wagging authoritarian Theresa May tells us that children in temporary accommodation are not waking up on the streets. He said that while May highlighted a decline in what is categorised as ‘statutory homelessness’, rough sleeping had increased by 130% since 2010. The category of ‘statutory homelssness’ has also been redefined to include fewer people who qualify for housing support. Last year, May surprisingly unveiled a £40 million package designed to ‘prevent’ homelessness by intervening to help individuals and families before they end up on the streets. It was claimed that the ‘shift’ in government policy will move the focus away from dealing with the consequences of homelessness and place prevention ‘at the heart’ of the government’s approach. However, there are a few causes that the prime minister seems to have overlooked, amid the Conservative ritualistic chanting about ‘personal responsibility’ and a ‘culture of entitlement’, which always reflects assumptions and prejudices about the causal factors of social and economic problems. It’s politically expedient to blame the victims and not the perpetrators, these days. It’s also another symptom of failing neoliberal policies. It’s a curious fact that wealthy people also experience ‘complex issues’ such as addiction, mental health problems and domestic abuse, but they don’t tend to experience homelessness and poverty as a result. The government seems to have completely overlooked the correlation between rising inequality and austerity, and increasing poverty and homelessness – which are direct consequences of political decision-making. Furthermore, a deregulated private sector has meant that rising rents have made tenancies increasingly precarious. Last year, ludicrously, the Government backed new law to prevent people made homeless through government policy from becoming homeless. The aim is to ‘support’ people by ‘behavioural change’ policies, rather than by supporting people in material hardship – absolute poverty – who are unable to meet their basic survival needs because of the government’s regressive attitude and traditional prejudices about the causes of poverty and the impact of austerity cuts. Welfare ‘reforms’, such as the increased and extended use of sanctions, the bedroom tax, council tax reduction, benefit caps and the cuts implemented by stealth through Universal Credit have all contributed to a significant rise in repossession actions by social landlords in a trend expected to continue to rise as arrears increase and temporary financial support shrinks. Housing benefit cuts have played a large part in many cases of homelessness caused by landlords ending a private rental tenancy, and made it harder for those who lost their home to be rehoused. Among the recommendations the NAO report authors make is this one: The government, led by the Department [for Housing] and the Department for Work and Pensions, should develop a much better understanding of the interactions between local housing markets and welfare reform in order to evaluate fully the causes of homelessness. Record high numbers of families are becoming homeless after being evicted by private landlords and finding themselves unable to afford a suitable alternative place to live, government figures from last year have also shown. Not that empirical evidence seems to matter to the Government, who prefer a purely ideological approach to policy, rather than an evidence-based one. The NAO point out that Conservative ministers have not evaluated the effect of their own welfare ‘reforms’ (a euphemism for cuts) on homelessness, nor the effect of own initiatives in this area. Although local councils are required to have a homelessness strategy, it isn’t monitored. There is no published cross-government strategy to deal with homelessness whatsoever. 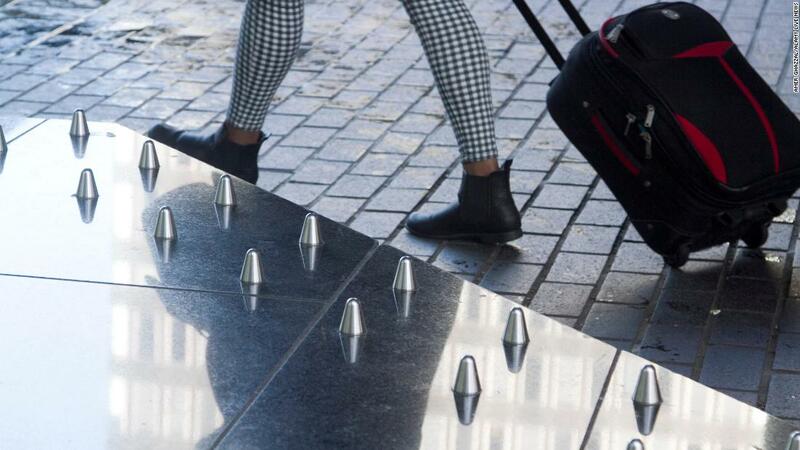 Ministers have no basic understanding on the causes or costs of rising homelessness, and have shown no inclination to grasp how the problem has been fuelled in part by housing benefit cuts, the NAO says. It concludes that the government’s attempts to address homelessness since 2011 have failed to deliver value for money. More than 4,000 people were sleeping rough in 2016, according to the report, an increase of 134% since 2010. There were 77,000 households – including 120,000 children – housed in temporary accommodation in March 2017, up from 49,000 in 2011 and costing £845m a year in housing benefit. Homelessness has grown most sharply among households renting privately who struggle to afford to live in expensive areas such as London and the south-east, the NAO found. Private rents in the capital have risen by 24% since the start of the decade, while average earnings have increased by just 3%. Cuts to local housing allowance (LHA) – a benefit intended to help tenants meet the cost of private rents – have also contributed to the crisis, the report says. LHA support has fallen behind rent levels in many areas, forcing tenants to cover an average rent shortfall of £50 a week in London and £26 a week elsewhere. This is at the same time that the cost of living has been rising more generally, while both in-work and out-of-work welfare support has been cut. It no longer provides sufficient safety net support to meet people’s basic needs for fuel, food and shelter. It was assumed when welfare amounts were originally calculated that people would not be expected to pay rates/council tax and rent. However, this is no longer the case. People are now expected to use money that is allocated for food and fuel to pay a shortfall in housing support, and meet the additional costs of council tax, bedroom tax and so on. Local authority attempts to manage the homelessness crisis have been considerably constrained by a shrinking stock of affordable council and housing association homes, coupled with a lack of affordable new properties. London councils have been reduced to offering increasingly reluctant landlords £4,000 to persuade them to offer a tenancy to homeless families on benefits. Housing shortages in high-rent areas mean that a third of homeless households are placed in temporary housing outside of their home borough, the NAO said. This damages community and family ties, disrupts support networks, isolates families and disrupts children and you people’s education. London councils are buying up homes in cheaper boroughs outside of the capital to house homeless families, in turn exacerbating the housing crisis in those areas. Meg Hillier MP, the chair of the Commons public accounts committee, said the NAO had highlighted a ‘national scandal’. “This reports illustrates the very real human cost of the government’s failure to ensure people have access to affordable housing,” she added. More than 9,000 people are sleeping rough on the streets and more than 78,000 households, including 120,000 children, are homeless and living in temporary accommodation, often of a poor standard, according to the Commons public accounts committee. The Committee say in a report that the attitude of the Department for Communities and Local Government (DCLG) to reducing homelessness has been ‘unacceptably complacent’. John Healey, the shadow housing secretary, said: “This damning cross-party report shows that the Conservatives have caused the crisis of rapidly rising homelessness but have no plan to fix it. “This Christmas the increase in homelessness is visible in almost every town and city in the country, but today’s report confirms ministers lack both an understanding of the problem and any urgency in finding solutions. Surely it’s a reasonable and fundamental expectation of citizens that a government in a democratic, civilised and wealthy society ensures that the population can meet their basic survival needs. The fact that absolute poverty and destitution exist in a wealthy, developed and democratic nation is shamefully offensive. However, Conservatives tend to be outraged by poor people themselves, rather than by their own political choices and the design of socioeconomic processes that created inequality and poverty. The government’s response to the adverse consequences of neoliberalism is increasingly despotic and authoritarian. The comments below from Simon Dudley, the Conservative Leader of the Maidenhead Riverside Council and ironically, a director of a Government agency that supports house building, (Homes and Community Agency (HCA)) reflect a fairly standardised, authoritarian, dehumanising Conservative attitude towards homelessness. Dudley uses the word ‘vagrancy’, which implies that it is the condition and characteristics of homeless people who causes homelessness, rather than social, political and economic conditions, such as inequality, low wages, austerity and punitive welfare policies. The first major vagrancy law was passed in 1349 to increase the national workforce and impose social control following the Black Death, by making ‘idleness’ (unemployment) and moving to other areas for higher wages an offence. The establishment has a long tradition of punishing those who are, for whatever reason, economically ‘inactive’: who aren’t contributing to the private wealth accumulation of others. The Vagrancy Act of 1824 is an Act of Parliament that made it an offence to sleep rough or beg. Anyone in England and Wales found to be homeless or begging subsistence money can be arrested. Though amended several times, certain sections of the original 1824 Vagrancy Act remain in force in England and Wales. It’s main aim was removing undesirables from public view. The act assumed that homelessness was due to idleness and therefore deliberate, and made it a criminal offence to engage in behaviours associated with extreme poverty. The language that Dudley uses speaks volumes about his prejudiced and regressive view of homelessness and poverty. And his scorn for democracy. the Bill considerably in its passage through Parliament, resulting in the rejection of many homeless applications received by the local government because of strict qualifying criteria. For the first time, the 1977 Act gave local authorities the legal duty to house homeless people in ‘priority’ need, and to provide advice and assistance to those who did not qualify as having a priority need. However, the Act also made it difficult for homeless individuals without children to receive accommodations provided by local authorities, by reducing the categories and definitions of ‘priority need’. Restricting the public areas in which sitting or sleeping are allowed. Removing the homeless from particular areas. Murphy James, manager of the Windsor Homeless Project, branded Cllr Dudley’s comments ‘disgusting’ and described the Southall accommodation offered by the Royal Borough of Windsor & Maidenhead as ‘rat infested’. He said: “It shows he hasn’t got a clue. He has quite obviously never walked even an inch in their shoes. James added the royal wedding should not be the only reason for helping people on the streets. “I am a royalist but it should have zero to do with the royal wedding,” he said. Dudley should pay more attention to national trends instead of attempting to blame homeless people for the consequences of government policies, as many in work are also experiencing destitution. This short film challenges the stereoytypes that Dudley presents. This is 21st century Britain. But still there are people without homes, still people living rough on the streets, including some who are in work, even some doing vital jobs in the public sector, low paid and increasingly struggling to keep a roof over their heads. Central government doesn’t keep statistics on the ‘working homeless’. But we do know that overall the number of homeless people is once again on the rise. Meanwhile, figures obtained via a Freedom of Information request by the Liberal Democrats from 234 councils show almost 45,000 people aged 18-24 have come forward in past year for help with homelessness. With more than 100 local authorities not providing information, the real statistic could well be above 70,000. While the inglorious powers that be spout meaningless, incoherent and reactionary authoritarian bile, citizens are dying as a direct consequence of meaningless, incoherent and reactionary Conservative policies. It is an excellent and very ‘moving’ report Ms Jones as are all your reports and observations. I greatly admire all that you have done and all that you do in the cause of that which I see as ‘enlightenment’. The big question for me remains – how does one penetrate that very narrow ‘tory’ mindset and effect any sort of meaningful change??? All good wishes for the New Year and thank you for all you do. Thank you Pat. I doubt very much that we can penetrate the narrow Tory mindset. Occasionally, there is a visible conflict and arising challenges within the Conservative movement though, which is promising. For example, Conservative MPs such as Anna Soubry and Heidi Allen and others voted against their own party recently, voting with the opposition and ensuring that elements of Brexit legislation are debated democratically in parliament. My aim is to persuade public, charity, academic, professional and grassroots campaigners that meaningful change is essential. As well as pushing for progressive change, the Tories will necessarily need to be removed from office, since they have shown over the past 7 years that they don’t care about the dire impacts and social damage caused by their draconian policies, that they don’t value human rights and democracy, that they don’t respond to reasoned debate and rationality, or empirical evidence. They will never listen to anyone who challenges their fundamentalism and neoliberal ideology. That makes them unfit for office. Next General Election, they will (and must) be voted out. That describes what I’ve noticed about public spaces very well. While I don’t have the sensitivity that you do, it seems the lighting and general environment of shopping malls and large stores is designed to cause a sense of confusion and disorientation, to encourage people to think less rationally and spend more. And the shopping malls almost always contain the same bland range of chain stores – no interesting small businesses or second-hand shops, for example. As shopping malls are private property, the owners can impose their own rules which go beyond the laws, and more easily exclude and discourage certain people. 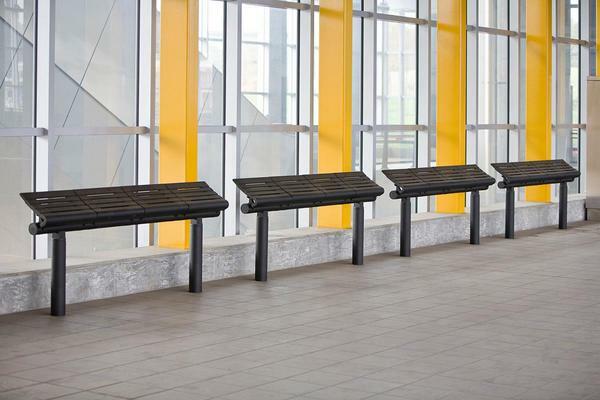 At my local bus station, the “seats” are angled bars about four inches deep – inconveniencing everyone who uses them. Even in this small market town, there are some other examples of hostile architecture. A while ago, dim UV lighting was installed over the cubicles in some of the public toilets, once again inconveniencing every user. I seriously considered changing the fluorescent tubes myself (since then one of them has been replaced by a normal white one – I don’t know who did it). All these things give the impression of government and local authorities being against the general public, not for us. Great article. The video about Lindy made me cry.